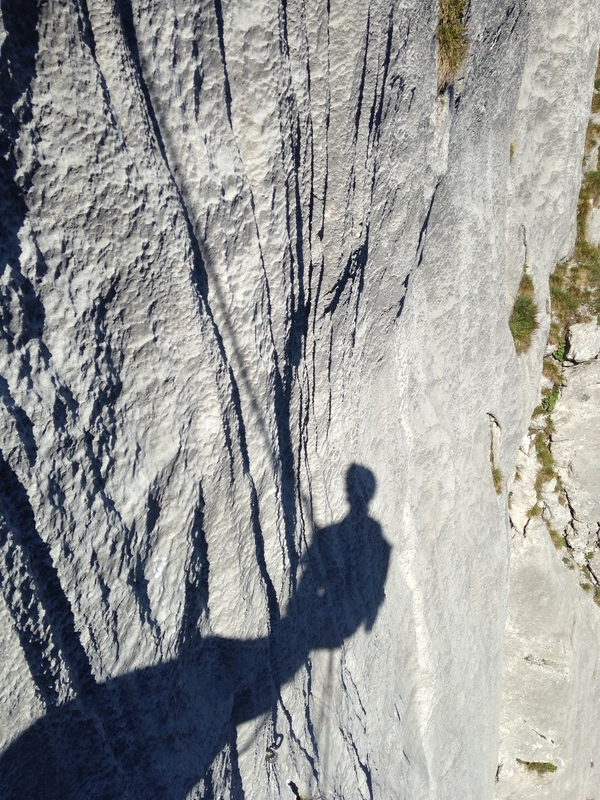 The Wendenstöcke (near to Interlaken in Switzerland) is one of the best climbing areas around if you like top quality rock, sustained and technical climbing and leg-shaking exposure (and occasionally run-outs). 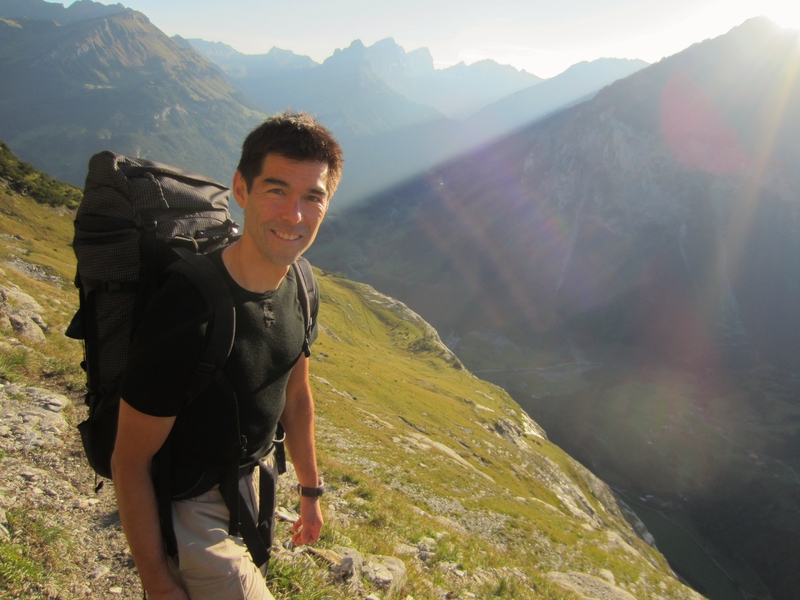 Any climb there is a memorable experience, and ever since I went there in 1997 with my brother and Swiss friend Christian, I’ve wanted to go back. As luck would have it, Murray wanted to go there this year. 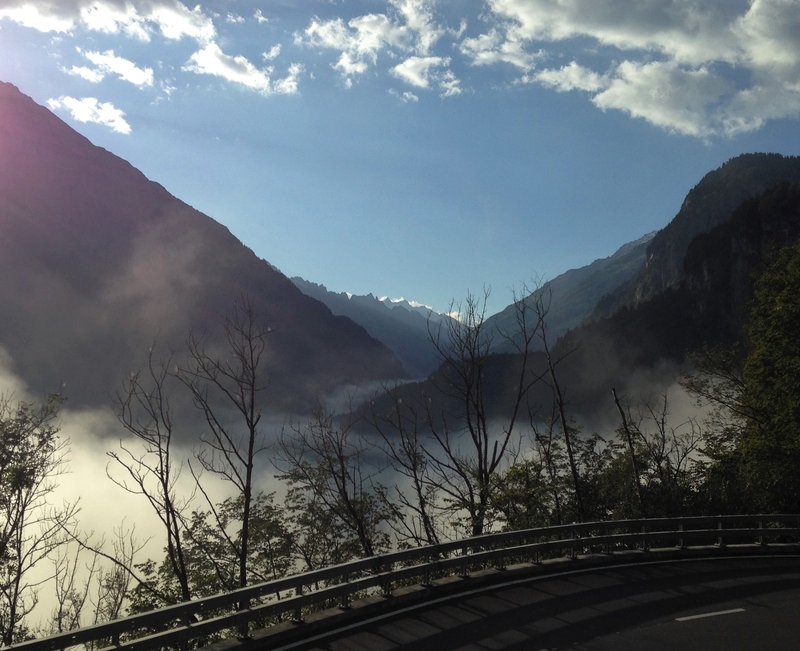 After a rainy evening in the campsite in Meiringen we drove up towards the Susten Pass on a clear sunny morning. 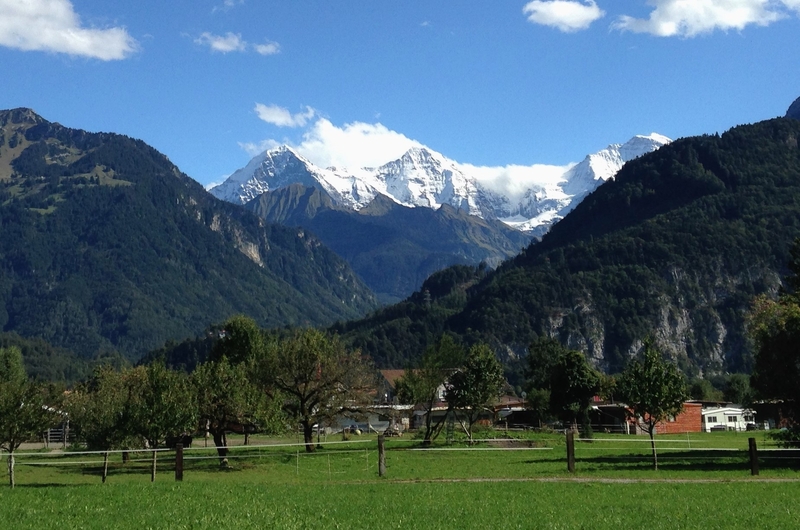 Unfortunately our first view of the Wenden was awe-inspiring and beautiful but not great for climbing as the peaks were covered with fresh snow. As we got closer we could see that nearly all the lines were covered with wet streaks from the rain and/or melting snow. 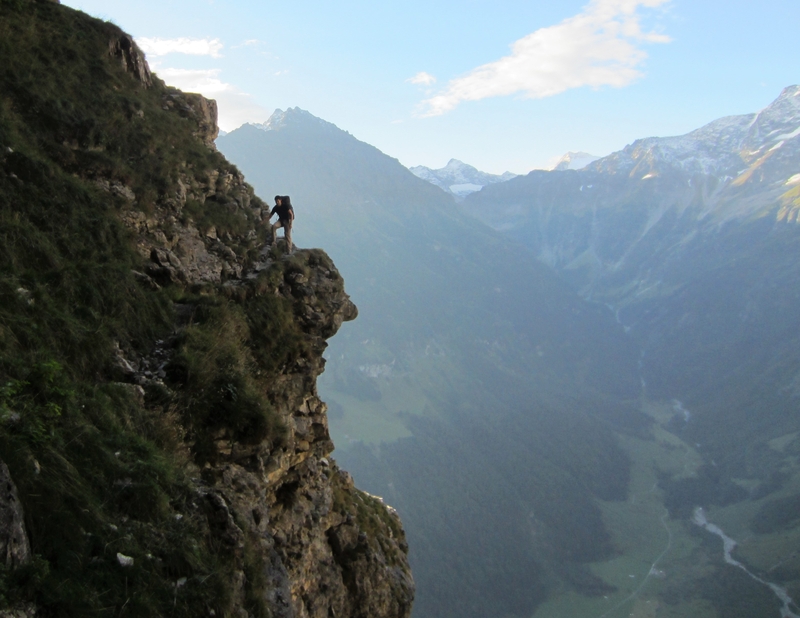 We had to console ourselves with some one pitch sports climbing on a smaller cliff below the main walls called the Glogghüser (this is actually at about 11 o’clock to the cow’s head in the photo above). 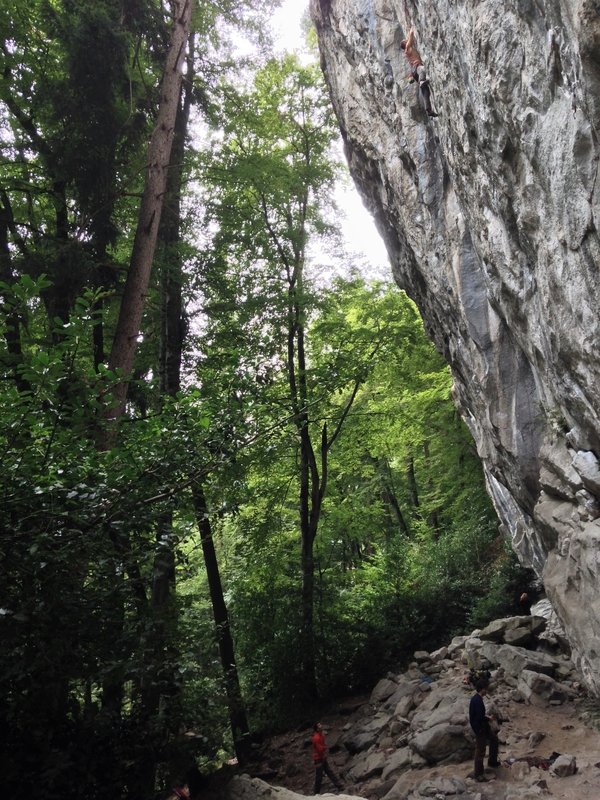 We did some climbs up to French 7b (redpoint) and thought they felt a bit hard for the grade… which wasn’t a great surprise as I knew that the grades there were tough. 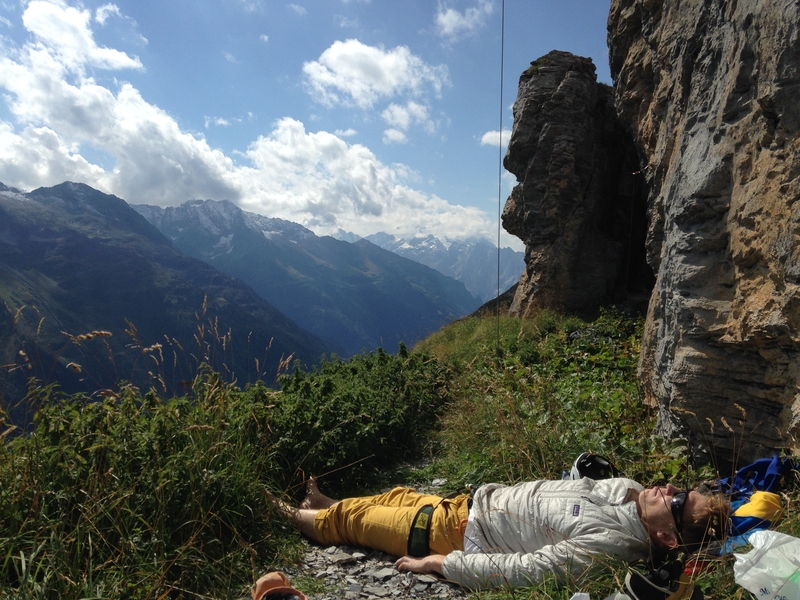 Still, it was interesting climbing and a good place to relax. 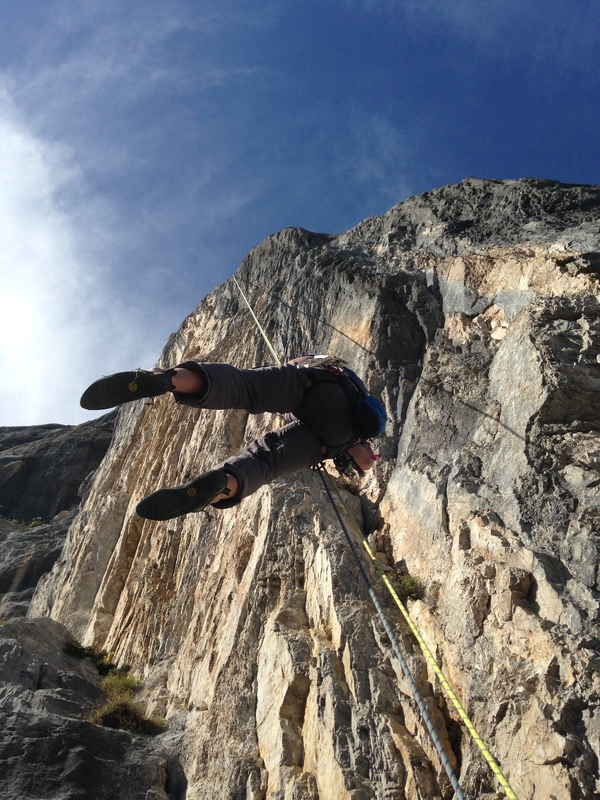 Because of the melting snow (the cliff actually seemed wetter in the afternoon as the temperature had risen) we decided to do a multi-pitch route on a different limestone face called Signal. I had also done a climb there with my brother and knew it was a great spot with a fantastic ambience and view. 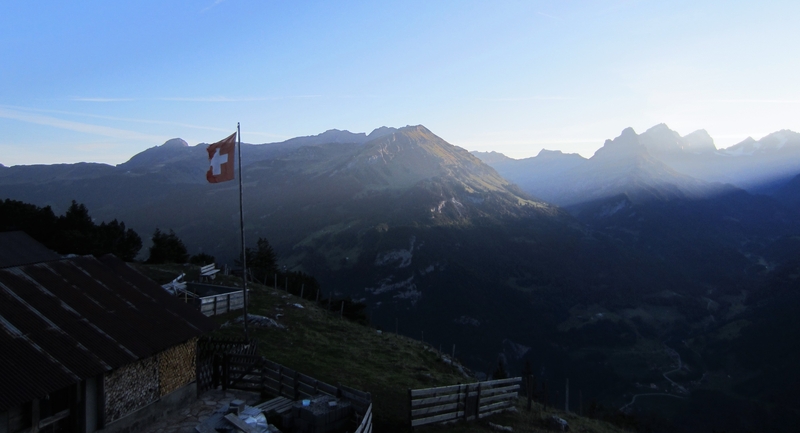 We did a recce of the approach the evening before (the walk-in starts at the top of a steep but drive-able track) and at 6.30am the next day we set off just as it was getting light. The walk-in took about 2 hours and initially went through forest followed by steep meadows full of sheep, many of whom thought I was the shepherd and ran down the mountain towards me. The last habitation was a hut with perfected stacked chopped wood in a place called Mad. We then started a rising traverse to the start of the route. 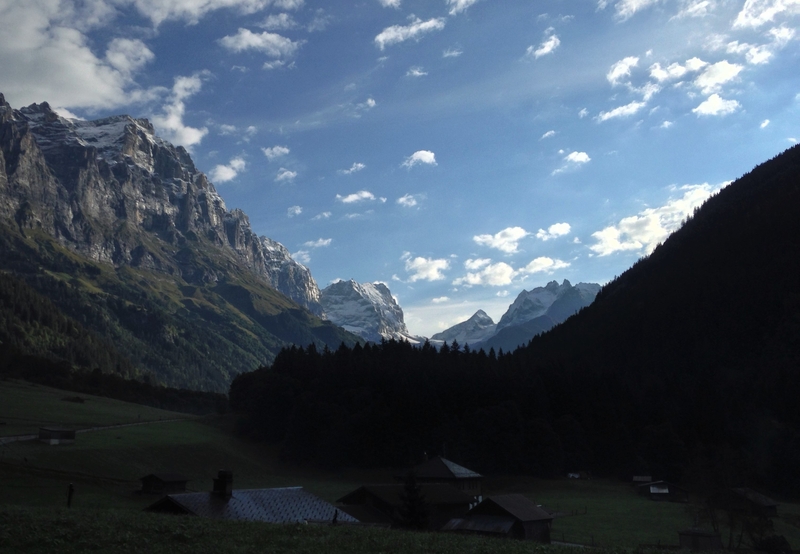 The sun was just hitting the tops of the peaks so we got a great view of the mountain at the end of the valley (which it turned out was called the Hangendgletscherhorn). I did not remember that much about the walk-in which was surprising as it was very exposed and quite scary; perhaps I had wiped it from my memory. We got to the bottom of the face, found the start of our route, had some bread and chocolate and started climbing at 9.15. The first pitch was meant to be 5b so I was somewhat unnerved by the first move with was stepping onto a slab with no footholds. 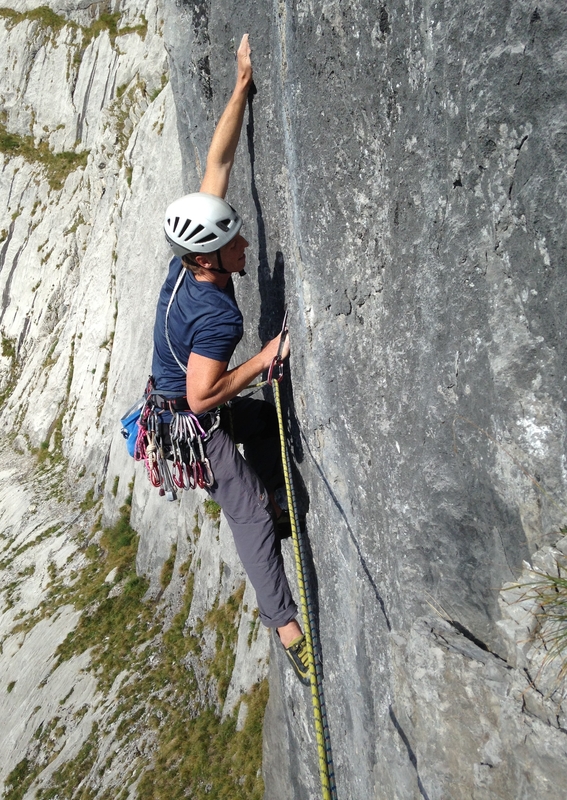 The pitch continued with some tricky climbing up some limestone flutings. It wasn’t very encouraging but I thought that maybe it felt hard because I hadn’t climbed a slab for years and once it got steeper things would feel easier. The next pitch was Murray’s lead and was up a steep wall and groove. That also felt hard for the expected 6b. Although Murray did a fine on-sight of it I had to rest near the top of the groove, pumped from having to climb the overhanging pitch with the rucksac (which the second was climbing with). 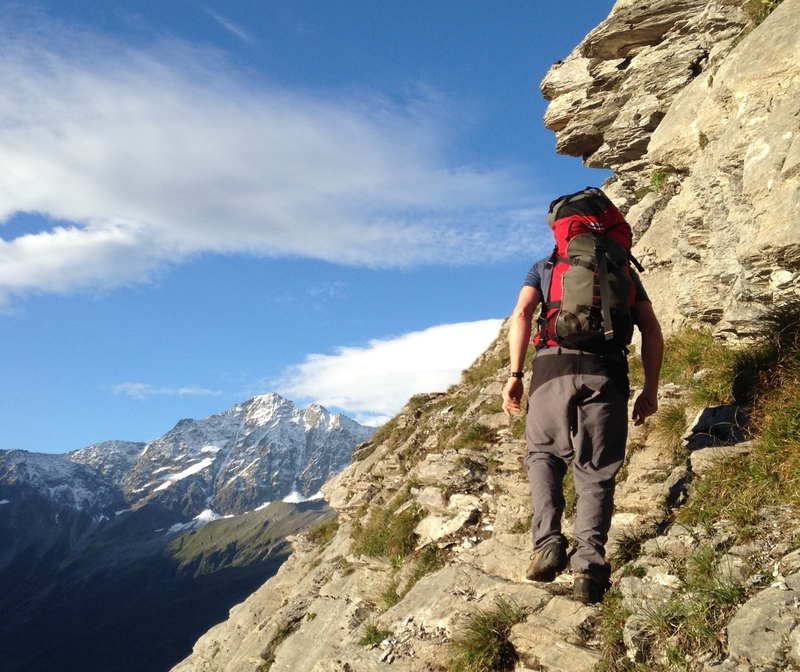 This pitch seemed to confirm what we suspected… which was that we were on the wrong route. Still the climbing was good and we assumed we were on a new route that was not in the guidebook, and decided to push on. Murray’s leads seemed to coincide with the harder pitches (which he cleanly dispatched though not without some effort) so I was feeling a little short-changed although also somewhat relieved. However I got my turn on a long technical pitch which included a wall with holds that were so small it was right on my on-sight limit. We were pretty convinced that these hard pitches must have been 7a or even harder. By now we had climbed 7 pitches and were nearing the top of the steep bit of the wall. Murray led a final steep section then disappeared out of sight. I continued to pay the rope out, then heard Murray shout that he was climbing back down. He had found that the only way onwards was up a loose and unprotected gully which he had climbed; however this ended in a wall with no sign of any further bolts or pegs. He had then descended to a tangle of rotting bits of rope which he thought looked so dodgy that he said he would prefer to down-climb the last pitch rather than lower off it. In the end he decided to lower off the last bolt so he abandoned a carabiner and was soon back with me, hanging from a good bolt joined to another by a manky bit of old, sun-bleached rope (which was thick enough to prevent us clipping the other bolt). Murray looked like he wanted to be pretty much anywhere else but where we were, and as it was about 2.30pm and the sun was moving off the face we decided to rappel down. On the way down we passed two Germans who had started a couple of hours behind us on the same climb. We asked them if they knew what climb we were on, which probably didn’t help improve the reputation for competence of British climbers; they told us they thought we were on a climb called Häxering. At the next belay we glanced at the topo and everything made sense… we had got the distance between the routes completely wrong and were on the climb before the one we thought we were on. 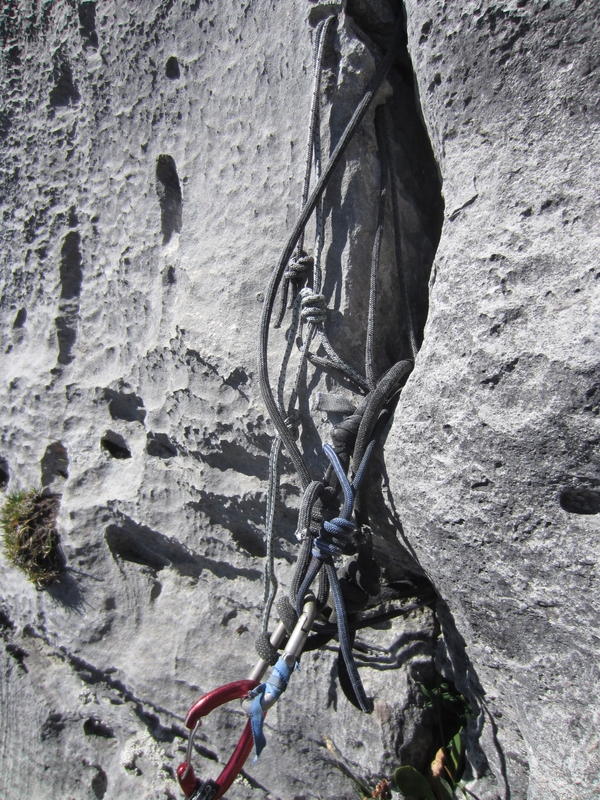 Häxering ended at the tangle of old rope that Murray found, which is why the bolts ran out. Obviously the route needed some re-equipping… that said most of the rappel stations were okay except for one where we backed up the existing bit of rotting rope with some tape. A couple of the rappels were quite steep as the photo below shows. After 5 rappels we were back on the ground and shaking hands before reminding ourselves that it wasn’t over until we were back over the scary traverse and in the meadows of Mad. It turned out we had done the best climb on the face (according to our guidebook). It had three 6c pitches and the first pitch (which I had thought should be 5b) was 6b+. So that was some consolation. 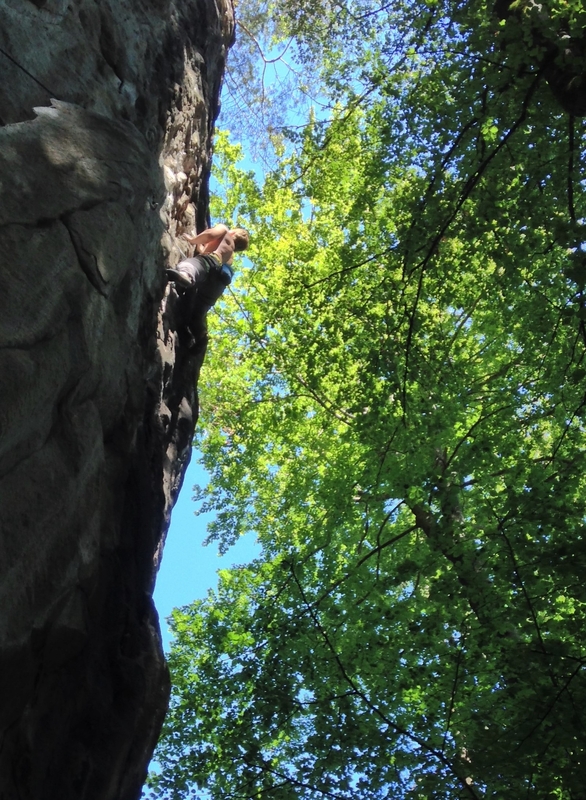 The general theme of finding great climbing but hard grades continued on our final day when we went to the excellent sandstone crag of Lehn and proceeded to only just on-sight a couple of 7a’s. The photo below shows Murray on one of them; Multi Müesli. Still it was a great crag with tons of really steep climbing which we’d like to go back to. 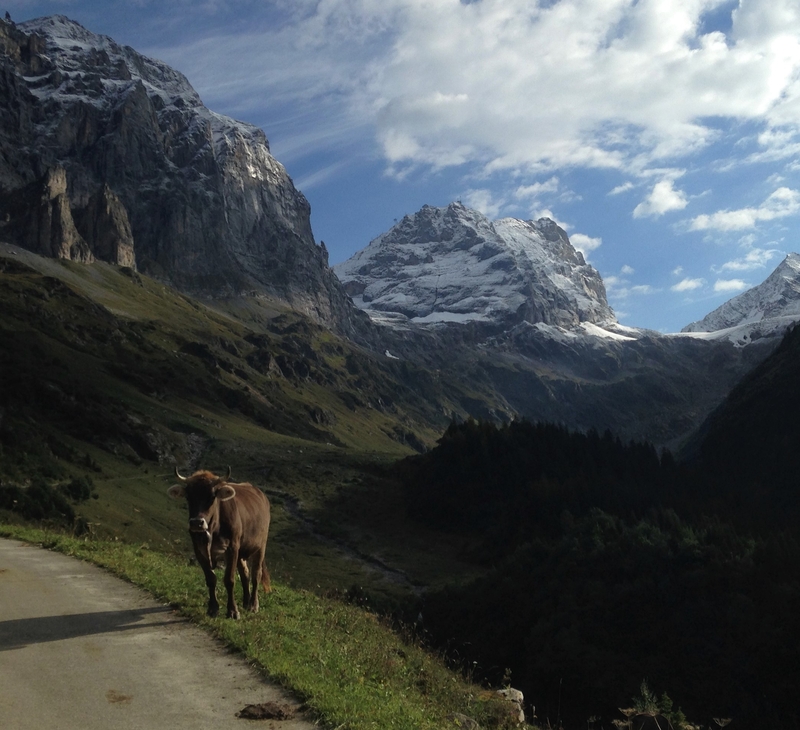 While we were climbing at Lehn the weather cleared up and we walked out of the forest to see an amazing view of the north face of the Eiger (which is the mountain on the left). It was a nice way to end the trip. Practical information on these areas is contained in a separate post: Practical Information.